Successfully battling through the extremely muddy conditions at the Villars-sous-Écot circuit, Thomas Covington has rounded out the 2017 FIM Motocross World Championship by claiming the overall MX2 class victory at the final round of the series in France. Gaining valuable points the Rockstar Energy Husqvarna Factory Racing Riders has climbed to fourth in the final MX2 World Championship standings. Covington entered the final in France determined to continue his strong run of form. Securing a sixth-place result during the MX2 qualifying race, the American proved more than ready to face the incredibly demanding track conditions during the two final motos on Sunday. Starting the opening moto in second, Thomas used his speed in the French mud to take the lead before the end of the opening lap. Keeping his head down he retained his advantage for the rest of the moto and despite a late mistake the American claimed his fifth victory for the season. Getting the holeshot in moto two, Thomas crossed the line in second to secure the overall class victory. Securing third in the MX2 World Championship standings during the previous round in The Netherlands, Thomas Kjer-Olsen was looking to end the season with a good overall result in France. Collecting 7-12 results the young Dane wrapped up an impressive rookie MX2 class season with sixth overall at the GP of Pays de Montbeliard. Struggling to get to grips with the tough track conditions, Rockstar Energy Husqvarna Factory Racing’s Conrad Mewse collected eight points by finishing 18th overall in France. In the 450cc class, the MXGP of Pays de Montbeliard was the ideal chance for Max Anstie to show his mud racing prowess. Claiming an impressive qualifying moto victory on Saturday, the young Brit battled to 4-2 results to eventually secure third overall at the GP. Anstie’s highlights came in the second moto with his runner-up result. With the track forming deep and sticky ruts, the FC 450 powered rider took the holeshot and lead the first 14 laps. Getting passed by Jeffrey Herlings with three laps to go, Anstie took the battle for the moto victory to the line to finally secure the runner-up result. Following a solid second half of season, Anstie wrapped up his rookie season in the 450cc class with ninth in the 2017 MXGP World Championship standings. Racing in front of his home fans, Rockstar Energy Husqvarna Factory Racing’s Gautier Paulin collected two top six results for a strong fifth overall at the French GP. Enjoying a stellar debut season aboard his FC 450 machine, the Frenchman secured third in the 2017 MXGP World Championship standings. 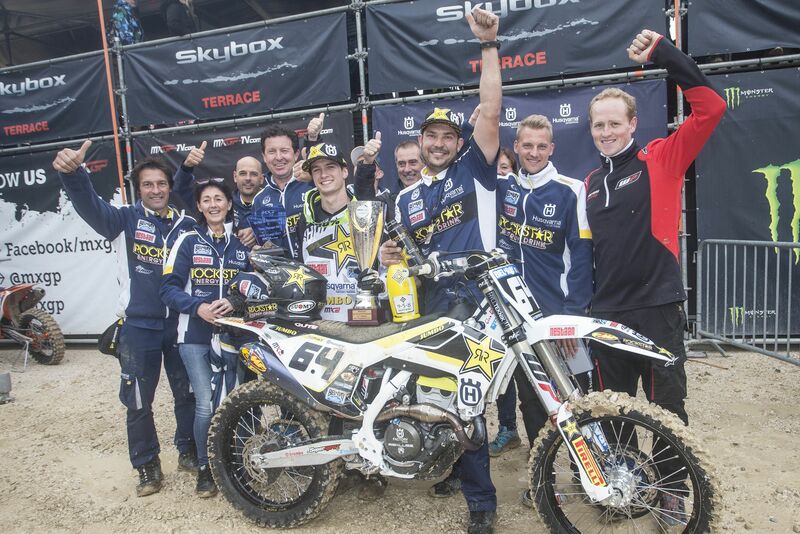 For Max Nagl, the final round of the series in France saw the German collect 14-12 moto results for 11th overall. Max finished the series by claiming eighth in the 2017 MXGP World Championship standings. The Rockstar Energy Husqvarna Factory Racing team will return to action at 2017 Motocross of Nations in Matterley Basin, United Kingdom on September 29/30.